9595-USA - CRUISIN' ON ROUTE 66 - 2.5" wide x 1.75" tall - Patches sew or iron-on & are carded for a retail display rack. © Holm Patches, Route 66 USA. 6894 - GET YOUR KICKS ROUTE 66 - 2 7/16" tall x 3.125" wide. Patches sew or iron-on & are carded for retail display. 6878 - HISTORIC US 66 souvenir embroidered patch. 2.5" wide x 2.5" tall. Patches sew or iron-on & are carded for a display rack for stores. 6880 - I TRAVELED ROUTE 66 souvenir embroidered patch. 2.5" wide x 2.5" tall. Patches sew or iron-on & are carded for retail display for stores. 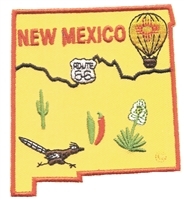 2566-01 - NEW MEXICO ROUTE 66 on black twill souvenir embroidered patch. 2.5" wide x 2.5" tall, iron-on backing. Patches are carded for retail display. 2566-39 - NEW MEXICO US 66 souvenir embroidered patch. 2.5" wide x 2.5" tall. Patches sew or iron-on & are carded for retail display for stores. 6895 - RETIRED CRUISIN' ON ROUTE 66 - 2.75" tall x 3.125" wide - Patches sew or iron-on & are carded to hang on a display rack. 6892 - ROUTE 66 shield on US flag souvenir embroidered shield patch. 1.375". Patches sew or iron-on & are carded for retail display. © Route 66 USA. 6876-01/8 - 8" ROUTE 66 highway sign embroidered patch for back of shirt or jacket. 8" on black twill. Patches sew or iron-on. 6876-01/8 - 8" ROUTE 66 highway sign embroidered patch for back of shirt or jacket. 8" on white twill. Patches sew or iron-on. 9596/1 - ROUTE 66 fire shield embroidered patch. 1.375" tall x 1.5" wide. Cut to shield shape. Patches sew or iron-on and are carded for retail rack display for stores. 9567 - ROUTE 66 map souvenir embroidered patch. 4.625" wide x 2 7/16" tall - Patches sew or iron-on & are carded for retail display for stores. ROUTE 66 shield embroidered patch. 2.5" wide x 2.5" tall. 6876-32 - ROUTE 66 shield embroidered patch. 2.5" wide x 2.5" tall. Patches sew or iron-on and are carded for retail display for stores. 6876-36 - ROUTE 66 red on black embroidered patch. 2.5" wide x 2.5" tall. Patches sew or iron-on and are carded for retail display for stores. 6876-01 - ROUTE 66 souvenir embroidered patch. 2.5" wide x 2.5" tall. Patches sew or iron-on & are carded for retail display for stores. 6876-39 - ROUTE 66 shield embroidered patch. 2.5" wide x 2.5" tall. Patches sew or iron-on and are carded for retail display for stores. 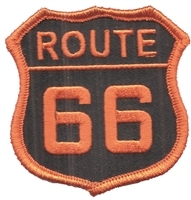 6876-56 - ROUTE 66 souvenir embroidered patch. 2.5" wide x 2.5" tall. Patches sew or iron-on & are carded for retail display for stores. 6877 - ROUTE 66 souvenir embroidered patch. Smaller than most of our ROUTE 66 patches: 2" wide x 1.875" tall. Patches sew or iron-on & are carded for a display rack for stores. 6893 - ROUTE 66 with state names souvenir embroidered patch. 3". Patches sew or iron-on & are carded for retail display. © Route 66 USA. 6886 - ROUTE US 66 souvenir embroidered patch. 2.5" wide x 2.5" tall. Patches sew or iron-on & are carded for retail display for stores. 9568 - SANTA MONICA End of the Trail 66 sign souvenir embroidered patch. 2.5" x 2.5" - Iron-on backing - Patches are carded for retail display. 3166 - TEXAS US 66 embroidered patch. 2.5" wide x 2.5" tall. Patches sew or iron-on and are carded for retail display for stores. 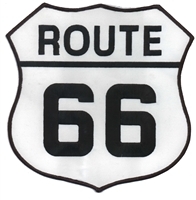 6899 - THE MOTHER ROAD - ROUTE 66 - 2.5" wide x 2.5" tall - Patches sew or iron-on & are carded for rack display for stores. 6900 - U.S. 66 Will Rogers Highway souvenir embroidered patch. Will Rogers Highway - U.S. 66 - CHICAGO TO LOS ANGELES - IL MO KS OK TX NM AZ CA - 3" - Similar to a US Highway Marker. Patches sew or iron-on & are carded for a display rack for stores. 0066-0002 -woodie souvenir embroidered patch 3.5" wide x 2" tall, iron-on backing. Patches are carded to hang on a retail display rack. © Paul "Kip" Dunne who built the 1928 Ford Woodie, © embroidered patch Holm Patches. This car is featured in the July 2015 Goodguys Good Times Gazette.